I’m in my third year at Cardiff Uni and I can honestly say that I’ve never seen students as competitive as they are at Varsity on any other day of the year. While this is expected for the people playing for the sports teams (they obviously want to win), it’s not just the players who are desperate to beat the green team. Be prepared to pick up plenty of chants and songs mocking Swansea, because there’s nothing we all want more than to win Varsity! 2. If you’re fan of drinking cider in the sun, make the most of it! The last two years of Varsity we’ve been lucky enough to have fantastic weather, so fingers crossed this will be the same this year. Of course, with sunshine comes the excuse to enjoy an afternoon drink or two. While you’re relaxing with your friends watching each of the matches, there’s nothing better than a cider in your hand and a big smile on your face! With such a wide variety of sports clubs competing on Wednesday, why not try and watch something you haven’t before? While we’re all obviously keen to watch the Rugby, there’s plenty of other matches on throughout the day as well. Canoe Polo, American Football and Men’s Fencing are just a few, so make sure you go and watch these if you have time. The whole day builds up to the Men’s Rugby match, which both Cardiff and Swansea are desperate to win! This year the match will take place at Liberty Stadium in Swansea, with coaches taking students from the events at Sketty Park in the day to the stadium in the evening. This match is the highlight of the day, so get ready to cheer as loudly as possible for the Cardiff team. 5. You’ll feel too tired to make it to the SU, but make sure you go anyway! If you managed to get a Full Package ticket for the day, you’ll also have entry to the SU when you get back to Cardiff in the evening. After all the excitement of the day, the early morning coaches and the cider consumed, you’ll likely start to feel very tired by this point (or at least I always do anyway!) If you can find the energy, however, I’d really recommend going to the SU! The atmosphere is always fantastic, and what better way to end the day than with a VK in your hand? If the weather is hot, make sure to take some sun cream with you. Sitting outside on a field all day might end up in not very nice sun burn if you forget to bring some. Have an idea of what you want to watch before you get to Swansea – make a rough plan with your friends on the matches you definitely want to see so that you don’t end up missing them. Be careful with how much you drink – remember that you’ve got the whole day, so don’t go overboard (and also remember to drink plenty of water in between). And last but not least…HAVE FUN! 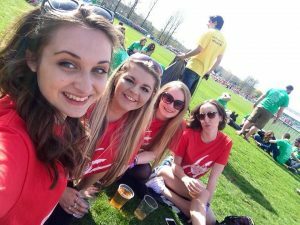 Welsh Varsity is so much fun, so enjoy yourself!